Punk rock music has become synonymous with Chuck Taylors throughout the years. The iconic shoes have been a staple in the garages of bands trying to make it to superstardom for decades now, and no band represents this sentiment more than Green Day. Ever since they started out in the East Bay of Northern California, Green day have been leaders in the punk rock movement, being a primary force behind the mainstream recognition the genre received in the 1990’s and early 2000’s. Their superstardom reached it’s peak in 2004 when they released their rock opera American Idiot, and it’s title track was a major hit and spawned an iconic music video. Lead singer Billie Joe Armstrong. 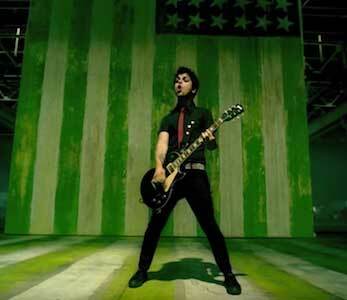 The “American Idiot” music video opens with Green Day playing in front of a giant, green-stained American flag, which is a nice reference to the band’s moniker. We see throughout the video camera shots of varying speeds and distances which gives the video a very frantic and energetic feel. The focus also shifts between shots of the band, and the cameras and monitors that are recording them. This conveys the song’s message about the media distorting American ideals and values. Slowly, the green paint on the flag starts to drip away. It accumulates at the bands feet, and then begins to spray out from the amplifiers that flank the flag. Green Day is covered in green paint by the end of the video, and once they finish the song, they leave their instruments in the mess they’ve made. 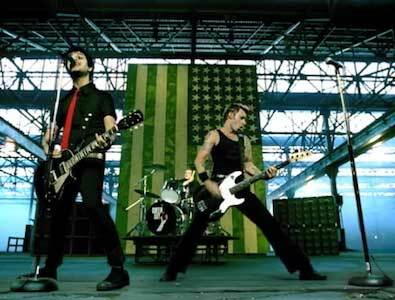 Green Day in an iconic image. Green Day in general wear chucks often as we have covered here on the site in our “Basket Case” music video review (click here to read!). 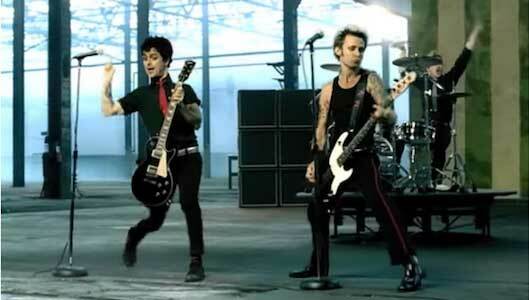 In the American Idiot video, Billie Joe Armstrong wears a pair of monochrome black chucks in this video, and since he is the lead singer and the main focal point of the video, we get many good shots with them. By the end of the video, they are less a pair of all black chucks and more of a dark green pair. With thought provoking images, and a great track behind it. Billie Joe Armstrong rocking in his chucks.